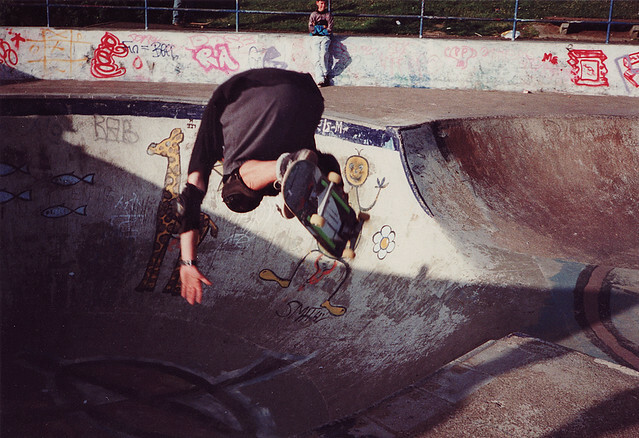 Jamie Blair, backside air in the pool at livi skatepark. Summer 1992 at a pro skate demo. Mark Gonzales and John Cardiel were there. I recently emailed him to ask him to confirm his identity in this pic and some others in my post about John Cardiel and he got back to me. it was nice of him, and I put his comments in the Cardiel post. He still owns and works at Clan Skates in Glasgow, but seems to be a bit more involved in the Scottish surfing scene than skateboarding now.